Have you ever wondered, why schools teach so little – if anything – about the world’s first advanced civilization? …Especially when it introduced so many things we still use today? Why the mystery around Sumeria, which was in Mesopotamia, in what’s now modern-day Iraq? The modern calendar based on lunar cycles, the 60/12 counting system used for geometry and measuring time, the wheel, the plow, irrigation systems like levees and canals, sailboats …they even spoke the first known language, and left evidence of the first recorded writing. That’s a lot of intelligent contributions to humanity, so why aren’t we taught more about this clearly advanced and influential civilization? Well, connect the dots, and you’ll discover why the omission could be deliberate. The Sumerians were accurate in creating many advanced systems, yet we dismiss their history of man as mere mythology. And why is that? Because if we gave the same credibility to their written history as we’ve given their inventions, we’d be teaching a completely different version of our origins …and, we’d be thinking a lot more about what our future may hold. So let archaeologists continue to debate the history and evolution of man. If you go to the source, here’s what the first civilization ever to record history revealed about our past. IN 1849, a British archaeologist discovered 14 tablets in Sumeria. To date, these are the oldest known writings, and they date back to the 24th century BC. While the stories on them share much of what other ancient writings say, they put a whole new spin on the other ancient sacred texts. You see, while they do refer to a “Father of All Beginnings,” or some kind of ultimate Supreme Being – the tablets say that the creators in Genesis, The Garden of Eden, Adam and Eve – these were polytheistic gods of ours: otherworldly beings- or just plain out: they were aliens. The entire first two tablets explain who they were and where they were from. Tablet 3 tells of the 6 days of creation – or settlement – on Earth. Later, they explain how the human race was genetic manipulated by these beings.and did not evolve randomly. Even the technology Sumerians gave us came from these beings. Are you interested now in knowing more about what the Sumerians had to say about our history? Here are selected legends from the 14 tablets, and their parallels with other ancient sources. According to the Sumerian tablets, 445 000 years ago, “creator gods” – as they call it – came to earth. The only inhabitants of earth were wild and undomesticated animals, and early ancestors of man. They were called the Anunnaki, which means “Those Who from Heaven to Earth Came”-. These beings inhabited a distant orbiting planet called Nibiru, which only entered our solar system every 3,600 years. They describe Nibiru as many times the diameter of Earth, and abundant with iron oxide, making its rivers and lakes appear red. A side note about Nibiru: according to the tablets, Nibiru’s atmosphere began to deteriorate and became a hostile place for life, and in order to restore it, the Annunaki needed one important element for their atmosphere: gold. Now here are a few interesting facts, there is proof that gold nanoparticles can be used to repair our damaged ozone. It shields radiation, which explains why NASA uses gold foils in their space stations. While NASA is currently aware of 8 official planets in our solar system, there is much speculation about the wobbly orbit of two planets, which points to the likely gravitational pull of a very large mass, which has yet to be discovered. “There are now five different lines of observational evidence pointing to the existence of Planet Nine,” . . . If you were to remove this explanation and imagine Planet Nine does not exist, then you generate more problems than you solve. Clearly there is potential for another planet yet to be discovered in our solar system. After many centuries, the Igigi rebelled – mistakenly believing they could overcome their oppressive masters. Their defeat almost complete annihilated the race, leaving the Anunnaki without their a work force. Unable to replace the Igigi, Nibiru’s ruler – Anu – ordered his son Enki, to genetically engineer a new slave race intelligent enough to perform complex work, but still be subservient to the Anunnaki. His experiments are recounted in detail in Atra-Hasis, and many unique creatures were created. 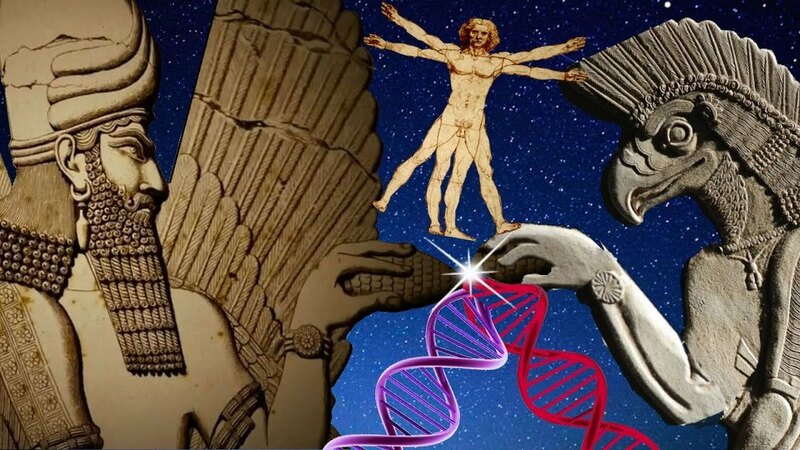 Enki finally successfully met his goal and the result: a genetic hybrid between Earth’s cavemen – Homo Erectus – and the Anunnaki themselves: this hybrid we call Homo Sapiens. The tablets called first man “the Adamu. “ In Hebrew, “Adam” means “man”. The Anunnaki put the homo sapiens to work in the mines and elsewhere in Mesopotamia. The Semitic word “avod”, or “worship,” literally means, “work for.” Hence, early man had no choice but to “worship” their gods. According to pictographs and texts, compared to man, these Annunaki – who we know lived for many centuries – were giants compared to homo sapiens. As humans evolved to become more intelligent, some Anunnaki leaders bred with humans. The children resulted from these forbidden unions between races were called the Nephilim, or, “the giants of old”. The tablets say that these practices enraged Enlil, the leader at that time, who was also the brother of Enki. Enlil wanted to ensure no human would ever rise to potentially rule Nibiru, and the interbreeding increases that risk. While human populations increased over thousands of years, they discover that nature has a plan for handling the over-population… an Nibiru orbit which creates havoc in the solar system. Nibiru is also called “the Destroyer” in the Kolbrin, which is an ancient gospel found in Scotland, that was omitted from biblical text much like the dead sea scrolls were. Though stating that Nibiru usually passes without causing harm, the tablets describe one cataclysmic event, which occurred when Nibiru neared Earth. We know this as The Deluge, or , The Great Flood. First, black spots appeared on the Sun’s surface, the Earth’s magnetic field became weaker, the temperatures rose, and the ice caps began melting. Enlil saw the oncoming disaster as an opportunity to rid of humans he deemed unworthy. He returned to Nibiru, but many Annunaki choice to stay, and witnessed the flooding and destruction on the planet from their “celestial boats”, which circled the Earth. At that point, the South’s Pole huge ice sheets collided and fell into the ocean. This would have created tsunamis everywhere. Traveling north towards the gold mines in Southeast Africa. The tidal wave continued North, until it reached and submerged the city of Eden – one of the first Anunnaki settlements on Earth – now located somewhere at the bottom of today’s Persian Gulf. Witnessing the cataclysm, Enki – who felt sympathy for his creations – instructed his chosen ones, to build boats. Among these few humans, was Ziusudra, (we know as Noah) and his family. The story of The Deluge, or The Great Flood is recorded in almost every civilization on our planet. Core ice samples taken from Greenland and Antarctica illustrate that at the height of the last ice age, the sea levels were 425 feet lower than they are today. And, more importantly, there is clear indication of a rapid sea rise. “Let the heart of the plain, the heavens reflect! . . . . Once Enki to this agreed, Enlil from the skies of distances took measures. Indeed, the pyramids -now questioned to be much older than originally determined – and many other ancient monuments are, in fact, aligned to the stars. When the Annunaki finally left Earth, their influence had reached every corner of the world, from Mesopotamia to India to South America. Before they left, they gifted humanity the Sumerian civilization, which was inexplicably advanced for its time – having made sort of a ‘sudden’ appearance as a mature and highly organized culture out of nowhere. The Anunnaki taught the Sumerians their way of life and established monarchs. Now here’s where it gets interesting: the kings would act as their emissaries on Earth and rule the people according to ancient principles. Unbeknownst to man, royal bloodlines were genetically manipulated by the Annunaki. This would, in turn, explain the strong aversion by nobility to interclass breeding. Some people speculate that the Annunaki have deceptively managed to control the Earth through selectively breeding of nobility for centuries… millenia. Others believe that one day, when Nibiru is once again close to our planet, the Anunnaki will return to restore rule over the slave race they created. This would explain the secrecy around Sumerian’s recorded history. Either way, 3,600 years approaches a new cycle. So now that you know what ancients reveal about our origins, perhaps you’d like to decide?